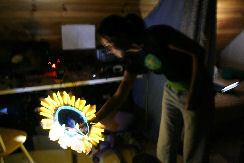 Alison sent over this link about the Sunflower Robots at this year’s Burning Man. She had previously introduced me to Stefano, creator of the project. These sunflower robots turned to face the sun during the day in order to charge their batteries, then at night they lit up and reacted to people who walked by to observe them. I think they are pretty amazing. Check out the info on the site!